In 1909, Slovenian immigrants Josef Grobelnik and Bartol Ramschak operated a popular tavern on South 15th Street. 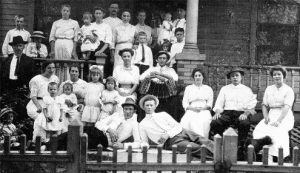 At the time, southeast Springfield was filled with young Eastern European families—most of them new arrivals to the U.S. While drinking there, Restar became angry and hurled a glass across the room, shattering a mirror. Grobelnik had enough. He chased Restar out of his tavern and onto the street, telling him to go home to his family. Grobelnik also filed a police report. Police questioned the highly intoxicated Restar, but in the end, they too ordered him home. He stumbled his way through the quiet neighborhood and let himself into his house. There, he sat down, positioned a loaded shotgun to his head and pulled the trigger with his toe. Newspaper coverage was graphic. Restar’s head was “blown apart,” spattering his skull “across the walls and onto the bed” where his wife and children were sleeping. Historically, starting in the mid-1800s, South 15th street from Laurel Street to Ash Street had been the home of working-class Irish immigrants. By the dawn of the 20th century, however, native Germans had moved into the neighborhood, along with immigrants from the Austro-Hungarian Empire – chiefly Hungarians, Austrians and Slovenians. As a result, an Eastern European enclave quickly developed that lasted for about 65 years. Slovenians, like most of their Eastern European brethren, originally came to Sangamon County to work in the coal mines. Men tended to work at either the Jefferson Coal Company (“the Brewerton Mine”) in southeast Springfield or at the Woodside Mine (Peabody No. 53) southwest of the city. Slovenians led a hardscrabble life in their native land. So, despite the austerity they encountered at first in the U.S., many of them were better off working in the central Illinois mines, even for meager wages, than facing life in the Austro-Hungarian Empire with chronic unemployment, obligatory military conscription and ethnic strife. Slovenia, wedged between Austria, Hungary, Croatia and Italy in southeastern Europe, became tied to Austria in the 1300s. In 1867, the Austrian Empire became a dual monarchy–the Austro-Hungarian Empire. Most of modern-day Slovenia remained in Empire’s Austrian sector while the Hungarians absorbed part of northeastern Slovenia, and Slovenians in the Veneto Region of Italy unified with the Kingdom of Italy. Political and nationalistic disturbances plagued the Austro-Hungarian Empire for the next 50 years. At the end of World War I in 1918, Slovenia became part of the State of Slovenes, Croats and Serbs, a forerunner to Yugoslavia. Yugoslavia was formally recognized in 1929; Slovenia was one of its six republics until 1991, when it declared its independence, clearing the way for the other five republics ultimately to separate. Slovenian emigration to Sangamon County began slowly in the late 19th century, but by the early 1900s, Slovenians (often counted as Austrians on ship manifests) were flocking to the U.S. in droves. Local accounts from 1911 say Slovenians had been settling in southeast Springfield “for the past fifteen years.” Sangamon County census statistics from 1910 counted Slovenians as Austrian; the numbers indicate the county then had 823 Austrian-born residents, 487 of them in Springfield. By World War I, the Journal reported, there were an estimated 600 Slovenians in Springfield. In September 1918, the Slovenian National Benefit Society held its annual U.S. conference in Springfield. Local chapter spokesman John Underwood (a Slovenian whose surname was Anglicized) commented about the association’s views on the global conflict. 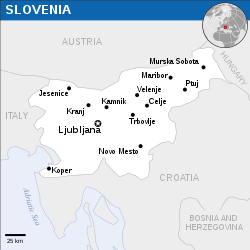 “It is [Slovenia’s] ambition to withdraw from Austrian influence and form the Jugo-Slav nation. Men high up in the Slovenian society attending the convention believe this is possible under the interpretation of President Wilson’s articles of international freedom.” Underwood pledged “100 percent American loyalty” for the war effort on behalf of the society. 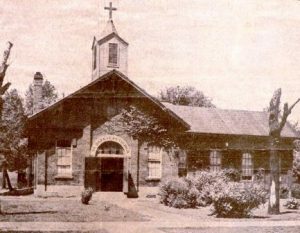 With about 60 Slovenian families living in the southeast part of Springfield prior to the war, Bishop James Ryan appointed Slovenian-speaking Catholic priests to develop the new church. The church was ultimately constructed inside the old school. Consecrated in 1910 and dedicated in April 1911, the church was named in honor of St. Barbara, patron saint of miners. Slovenians in Springfield also developed their own neighborhood clubs and social organizations. The Springfield chapter of the Grand Carniolan Slovene Catholic Union (today the American Slovenian Catholic Union), a Joliet-based fraternal group, had about 200 members. The Slovenian Workers Home on South 11th Street served as a chapter of the Slovene National Benefit Society (Slovenska Narodna Podporna Jednota), founded in 1904. St. Barbara’s Church also sponsored Benevolent Society No. 74, which met once a month in the school hall. Against this cultural backdrop, Josef Grobelnik (1884-1941), Bartholomaus “Bartol” Ramschak (1864-1941) and Mikael Restar (1864-1909) sailed together in October 1903 from Europe aboard the SS Vaderland for New York City. Their final destination was Springfield. Grobelnik was 29 years old and single, the son of Josef and Josefa (Kraker) Grobelnik, who both remained in Europe. Ramschak was also Slovenian, while Restar was an Austrian of German decent. In November 1908, Restar applied for U.S. citizenship in Sangamon County, indicating in the process that his wife Maria and their four children were living with him. Listing coal mining as his occupation, he also signed an oath to relinquish his allegiance to Emperor Franz Josef of Austria and Emperor Wilhelm II of Germany. Ramschak also applied for U.S. citizenship in Sangamon County that month, and he too gave up his allegiance to the Austrian emperor. The men were on their way to becoming loyal, hard-working citizens. Restar’s presumed friendship with Ramschak and Grobelnik probably explains why he frequented their tavern on South 15th. In the wake of his suicide, Restar’s family sued Grobelnik and Ramschak for $10,000, claiming that the copious amount of alcohol served to him at the tavern led to his suicide. Newspaper records don’t say how the suit was resolved. Adding to the tragedy, young Michael Restar Jr. was killed six years later when he was run over by a freight train he had hopped. Restar’s wife Maria died in 1919 following complications from the flu. 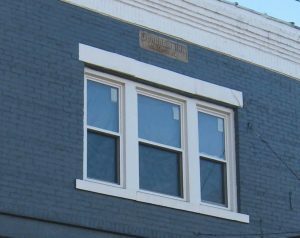 Following the Restar family’s lawsuit, Josef Grobelnik purchased a building at the corner of 15th and South streets. In 1912 he added two stories (construction was noted in a December 1912 Illinois State Journal) and he had a keystone fixed on the façade (albeit with his surname spelled incorrectly) that is visible today. Grobelnik and his family lived in part of the building. The ground floor became Gaffigan’s Grocery, while Grobelnik and Ramschak continued to operate their tavern in the block to the north. In 1916, however, Grobelnik bowed out of the tavern partnership and opened his own grocery and confectionery in the ground floor of his building. Ramschak kept the tavern (renamed Ramschak’s Corner). 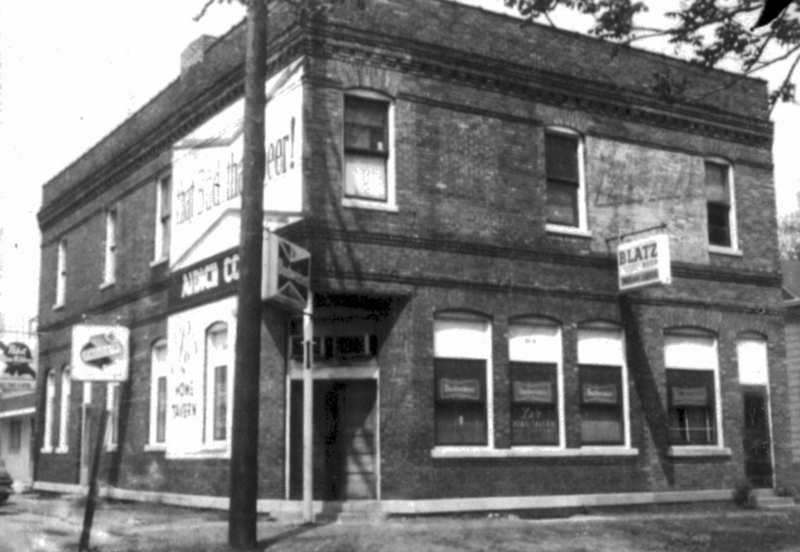 Later, Joseph C. White became part owner, and the bar was called Ramschak and White. 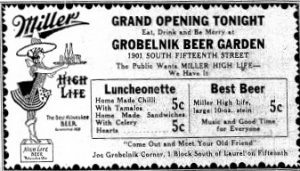 After prohibition, Grobelnik turned his grocery store into a tavern, which he sold in 1937 to an Italian immigrant, Guido Manci. Manci changed the bar’s name to Roxy’s. Three other Italians went on to own the tavern: Angelo Angeli, Antonio Fioriti and his nephew, Louis Nardi. 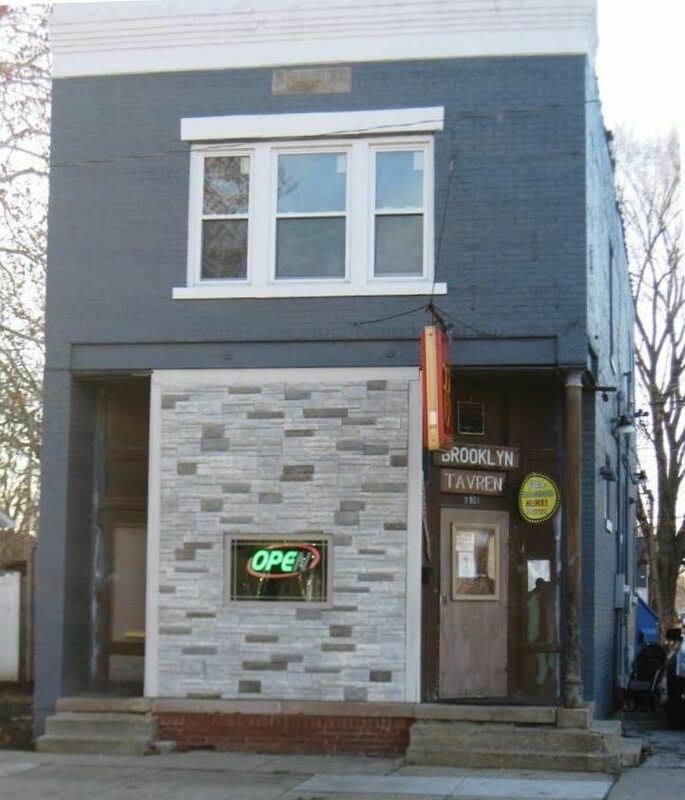 Roxy’s was renamed the Brooklyn Tavern after World War II; it still served patrons in 2018. Josef Grobelnik died at age 57 in 1941. His funeral was held at St. Barbara’s Church. In April 1947, Joseph’s wife, Josephine, passed away at 63 years old. Her seven children, two sisters and one brother survived her. The funeral was also held at St. Barbara’s. By the mid-1960s, the southeast side’s once vibrant Eastern European enclave was beginning to change demographics. The coal mines were shutting down, and the close-knit Slovenian families who attended St. Barbara’s began to move out of the area. They married at other churches around town, and many also chose to marry outside their Slovenian ethnicity. St. Barbara’s Church was dismantled in the summer of 1957. The closing of the church and its school was an elegy not just for the neighborhood, but also for Slovenian cultural life in Springfield and Sangamon County. Correction: This entry originally gave an incorrect spelling for the last name of Michal Restar. The family apparently later adopted the spelling “Restare,” which is how Restar is listed by Findagrave.com (he is buried in Springfield’s Calvary Cemetery). However, contributor William Cellini Jr. says several sources, including Restar’s 1908 U.S. naturalization petition, indicate the original spelling was Restar. (Cellini’s original draft had the correct spelling; the error was introduced by SangamonLink’s editor.) There are also questions about the spelling of his first name. The naturalization petition gives the spelling “Mikael”; he apparently was recorded as “Michal” Restar when he arrived at Ellis Island in 1903; and several local references give the Anglicized spelling “Michael.” Cellini adopts the Ellis Island version. Finally, the naturalization petition reports that Restar was born Sept. 29, 1864; Findagrave gives no birth date. More information: See SangamonLink’s entry on St. Barbara’s Church. This entry was posted in Buildings, Business, Churches, Crime and vice, Ethnic groups, Hotels & taverns, Social life. Bookmark the permalink. I don’t know if this is the tavern that a Slovenian member of our SNPJ in Lincoln took me and others to or not. I was just a kid and I don’t know what year it was but he brought me because I, too, am Slovenian and he wanted me to see what they did during the grape festival they were holding. I remember there was a huge bunch of grapes made to look like one. It was made out of purple grape bunches in the shape of a purple grape bunch. All of the Slovenians in Lincoln worked in the mine, too. My grandfather, Frank Petelinsek, John Debelak, Mr. Brilli, etc.. The Germans and Slovenians were close in Lincoln and families did things together pretty much. Nice work, William Cellini, Jr. I had read about St. Barbara’s and knew of the local Slovenes because two Slovenian sisters who made up two-thirds of the musical group, “The Slovenian Strollers,” both married Lithuanian men. The two sisters played a classic squeezebox and sang at our Lithuanian-American Club Christmas party two years in a row. They used to sing at other ethnic events, as well. Maybe another story? That would be Margie (Amalia) Struekel Stockus Roth, and her sister, Josephine Struekel Sneckus. Margie and Jo are still with us. Marge still plays her button box. My cousin, Gayle Stockus Chrans could put you in touch with Margie. She has an amazing story to tell. Glad to hear that Marge is still up to telling her story. Has the family ever written it down?